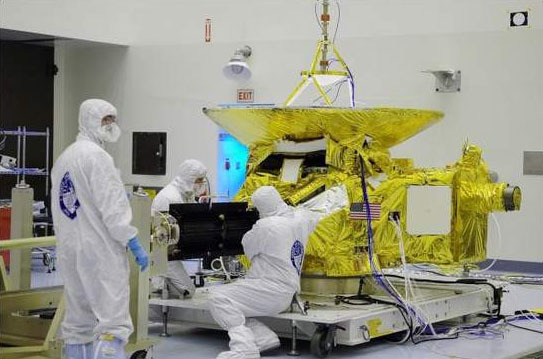 As you read these words, the New Horizons spacecraft remains in a long period of almost continuous hibernation, which began on Feb. 21 and stretches until Sept. 2. During this time the spacecraft will fly from nine to almost 11 times as far from the Sun as the Earth is, covering more than 300 million more kilometers! Except for two weeks of high activity that begins May 20, the spacecraft is running on its own, and doing little besides reporting its status each Monday and delivering a brief telemetry report most Thursdays. These contacts have shown that things are going well: all of the weekly status reports (technically called “beacon tones”) have been green, and all of the telemetry passes have indicated that the spacecraft is performing well. New Horizons, with its golden Mylar thermal covering, goes through preflight preparations at NASA’s Kennedy Space Center. Although our spacecraft has been hibernating, our ground and science teams are anything but quiescent. Planning for the Pluto encounter is in full swing. Our goal is to complete the near-encounter sequence design and testing within a year, so that we can conduct a full rehearsal on New Horizons in mid-2009. In fact, just this week we completed an Encounter Requirements Review to verify that, before we begin designing the detailed encounter sequences, we have a complete list of every scientific and navigation activity that we plan to conduct during the encounter. In June we will conduct an Encounter Feasibility Review, in which detailed encounter plans will be tested against dozens of ground and spacecraft constraints – such as power, data storage and available fuel – to ensure that each aspect of those plans is feasible. We’ll follow that review with a Preliminary Design Review in August, after which detailed sequence building will get under way. 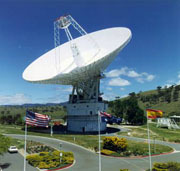 Large antennas like this one in Canberra, Australia, form the Deep Space Network (DSN) that NASA uses to track missions beyond Earth orbit. In addition to transmitting commands and receiving telemetry from New Horizons, this particular antenna will be used on July 14, 2015, to generate the radio occultation signal that our spacecraft will use to probe the temperature and pressure of Pluto’s atmosphere. July 2015 may be seven years away, but with our need to reduce our team size and budget after 2009, New Horizons must complete its encounter planning, ground testing, and a full dress rehearsal on the spacecraft barely more than one year from now! The New Horizons team is also busy planning sequences for this fall’s spacecraft and instrument checkout period, which will run from Sept. 2 to mid-November. In addition to the annual tests, this fall’s activities will also include uplinking new command and data handling, guidance/navigation, and fault protection software that resolves several dozen minor bugs and provides new capabilities that will improve our ability to perform at Pluto and in the Kuiper Belt. The team is nearly finished building and beginning to test “NHOPS II,” our second (and long desired) backup New Horizons spacecraft simulator, which will be operational at the Johns Hopkins Applied Physics Lab (APL) by late summer. I mentioned our plan to wake up New Horizons for a couple of weeks beginning on May 20; the main reason for the wake-up is to reposition the spacecraft antenna to account for the motion of Earth around the Sun. We have to do this several times each year, and we use it as an opportunity to combine important activities that need to occur between annual checkouts. 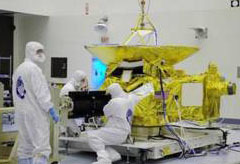 This time, spacecraft activities will include navigation ranging tests that mimic Pluto operations; spacecraft tracking; downlinking data that the Venetia Burney Student Dust Counter instrument has collected this year; a "bug fix" software upload and subsequent test of the SWAP solar wind plasma instrument; and an upload of the spacecraft command sequence that will guide New Horizons from June 3 to Sept. 5. 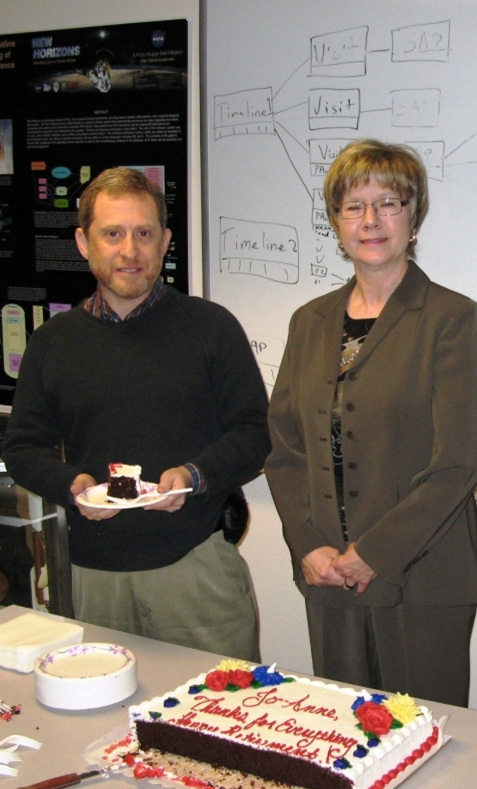 The last thing I’ll mention is that our project secretary, Jo-Anne Kierzkowski, retired a couple of weeks ago. JoAnne worked at APL for many years, and had been with the New Horizons project since our team formed in December 2000. Jo-Anne provided us with expert project coordination, from the start of our proposal writing, through spacecraft design, build, test and launch, and the first 1.5 billion kilometers of travel toward Pluto. Although she isn’t going far and will be celebrating with us at the Pluto encounter in 2015, we will miss her work and her cheerful smile every day in between. Well, that catches you up with where New Horizons is and what the spacecraft and project team have been doing. I’ll be back with more news soon. In the meantime, keep on exploring, just like we do! Everyone on New Horizons will miss our retiring secretary, Jo-Anne Kierzkowski, who began with the project team at its inception in late 2000.